Author: Angela Hanscom is a pediatric occupational therapist, with a master’s degree in occupational therapy and an undergraduate degree in Kinesiology (the study of movement) with a concentration in health fitness. 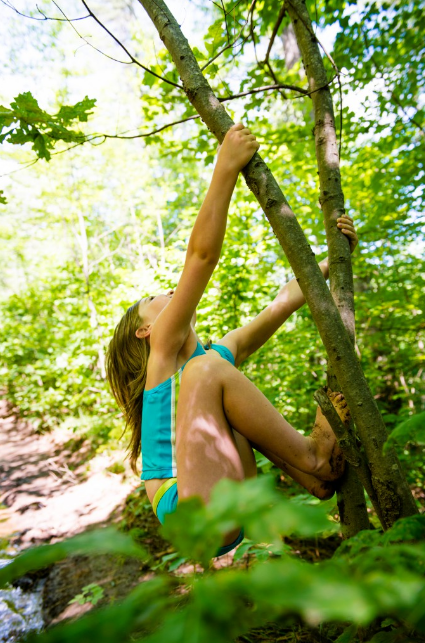 "As we continue to decrease children’s time and space to move and play outdoors, we are seeing a simultaneous rise in the number of children that are presenting with sensory deficits. The number of children that now need occupational therapy services to treat their sensory systems is on the rise". "Secondary to restricted movement and less time outdoors on a regular basis, more and more children are walking around with underdeveloped vestibular (balance) systems. In other words, they have decreased body awareness and sense of space. Teachers are reporting that children are falling out of their seats in school, running into one another, pushing with more force during games of tag, and are generally clumsier than in years past. In fact, the more we restrict and coddle our children, the more unsafe they become". "A child’s neurological system is naturally designed to seek out the sensory input it needs in order to develop into a strong and capable individual. For instance, if a child starts jumping off small rocks, that is because their brain is ready for this type of activity. If a child is spinning in circles just for fun, it is because he or she needs that sensory input. If they climb a tree effortlessly, it means they are capable of doing so". "It is only when adults consistently step in and say, “no” to everything physical the child attempts that we start to see problems in development. “No climbing,” “no running,” “no playing tag,” “no spinning,” “no picking up sticks,” “no getting dirty,” “no jumping off the rocks,” “no climbing the rocks,” we yell when children attempt any kind of risk."